Homemade Doughnuts (Donuts) are hard to beat. And I'm talking about homemade "raised" doughnuts. The ones made from a buttery rich yeast dough that are deep fried and then rolled in sugar. There is no doubt that these doughnuts are best eaten freshly made. That is when the sugary outside crust is wonderfully crisp. Yet when you bite through that crust, the inside is so soft and tender. I find it almost impossible to eat just one. The name "doughnut" may be American, as is the making of the "hole" in the center of the doughnut. But this ring shaped snack we know and love is said to have originated in Holland. Gaitri Pagrach-Chandra in her excellent book Windmills in My Oven, tells us that making doughnuts, or Oliebollen (when translated means 'oil balls'), are mainly a New Year's Eve tradition in Holland. That's much different than here in North America, where doughnut shops are everywhere, and we eat them all year round, and anytime of the day. 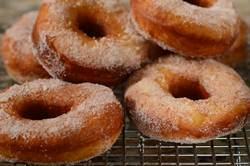 There are two types of Homemade Doughnuts, cake doughnuts (leavened by baking powder) and yeast "raised" doughnuts. As I said above, this recipe is for a yeast doughnut and its tender crumb comes from adding butter, an egg, and milk to the dough. I like to use 'active dried yeast' to make the doughnuts. This is fresh compressed yeast that has been pressed and dried until the moisture content is only about 8% which makes the yeast dormant. The granules only become active again when mixed with a warm liquid. The tiny, dehydrated, bead-shaped, sand colored granules are sold in either small foil-lined packages weighing 1/4 ounce (7 grams) or small jars. Now, the dough needs to rise twice, the first rise taking about 1 1/2 - 2 hours. Then the doughnuts are cut out, placed on a baking sheet, and left to rise again until almost doubled (about 45 - 60 minutes.) Then we are going to deep-fry the doughnuts so you will need a heavy bottomed saucepan (Dutch Oven) or deep fryer. Use a flavorless oil like corn, canola, or a vegetable oil. Peanut oil is also very good. Heat the oil, over medium-high heat, to 375 degrees F (190 degrees C) (this will take about 20-30 minutes). It's important to maintain that temperature as at this temperature the oil seals the outside of the doughnut so it doesn't soak in. You see, if the oil is too hot the doughnut will get too brown and crisp on the outside before the inside has time to be cooked through. Conversely, if the oil is not hot enough, the doughnut will absorb too much of the oil and the texture will be soggy and greasy. So clip a candy thermometer to the inside of your pan so you can constantly monitor the temperature of the oil, adjusting the heat as necessary. (If you don't have a candy thermometer, test to see if the oil is ready by placing a small cube of bread into the hot oil. If it browns in about 30-45 seconds, the oil is at the correct temperature.) Of course, always be very careful when deep frying. Never leave the hot oil unattended and have a fire extinguisher close by. Homemade Doughnuts: In a large bowl whisk together 2 1/4 cups (295 grams) flour and the yeast. Add the butter and, with a pastry blender or your fingertips, cut or rub the butter into the flour mixture until you have coarse crumbs. Stir in the sugar and salt. Make a well in the center of the flour mixture and add the lukewarm milk and lightly beaten egg and stir until you have a ball of dough. Add more flour, a tablespoon at a time, if necessary. Then transfer the dough to a lightly floured surface and knead until the dough is no longer sticky and is smooth and elastic (about five minutes). Shape the dough into a ball and place in a large lightly greased bowl, turning once. Cover the bowl with plastic wrap and let rise in a warm place until doubled (approximately 1 1/2 - 2 hours). Then place the dough on a lightly floured surface, and gently punch the dough to release the air. With a lightly floured rolling pin, roll the dough to a thickness of about 1/2 inch (1 cm). Cut the dough into about 2 1/2 - 3 inch (6-7 cm) circles, using a lightly floured doughnut cutter or cookie cutter (will need a smaller cookie cutter to cut out the center "hole"). Place the doughnuts on a lightly floured baking sheet, lined with parchment or wax paper. Gather up the scraps, roll, and cut out remaining doughnuts. You can keep the donut holes to fry separately, if you like. Loosely cover the doughnuts with plastic wrap (lightly butter or spray the plastic wrap with a non stick vegetable spray so the doughnuts won't stick) and let rise in a warm place until almost doubled (about 30-60 minutes). Clip a candy thermometer to the inside of a large, deep, heavy bottomed saucepan (Dutch oven), and at medium-high heat, bring about 2 inches (5 cm) of oil (canola, vegetable, peanut, or corn) to 375 degrees F (190 degrees C). Carefully place the doughnuts into the hot oil, about 2 to 3 at a time (do not over crowd). Fry each side until golden brown, about 45-60 seconds per side. The doughnut holes will only take about 30 seconds per side. Carefully remove the doughnuts from the hot fat with the end of a wooden spoon, tongs, slotted spoon, bamboo chopstick, or Chinese skimmer. Place on a baking sheet lined with clean paper towels. After a minute, roll the doughnuts in the sugar. Let the oil return to 375 degrees F (190 degrees C) before adding more doughnuts. These doughnuts are best freshly made.